The best areas in Spain to discover the sublime Spanish native varietal white wines is Galicia, a cluster of the northwestern provinces in Spain.Their native varietals contribute to refreshing, often terroir-laced, high quality white wines as discovered by our American panelist food & wine writer Gerry Dawes during his travel through this region. The Natives: The best areas in Spain to discover the sublime Spanish native varietal white wines is Galicia, the northwestern provinces of Spain. In addition to the well known Albariños from Rías Baixas , white wines from the other Galician regions, are now vying to become international white wine contenders. Although some of the blends include albariño grapes, many producers are increasingly confident with their home-grown varieties, such as treixadura (Ribeiro and Rías Baixas), godello (Valdeorras, Ribeira Sacra and Monterrei) and loureiro (Ribeiro and areas of Rías Baixas along the Miño River). These native varietals contribute to surprisingly refreshing, often terroir-laced, high quality white wines that can be exceptional food companions. Ireland of Spain: Because it is rainy and emerald-green for part of the year, has deep Celtic roots and boasts a very long, often breathtakingly beautiful Atlantic coastline notched with deep, fjord-like inlets, Galicia is often billed as the Spanish equivalent of Ireland. Its people even share the Irish love of potatoes. But unlike the Emerald Isle, Galicia's more southerly latitude affords the sunshine necessary to properly ripen wine grapes, in most years. The Vineyards: Because of its high rainfall--some 63 inches annually in Rías Baixas and just under 40 inches in most other Galician D.O.s, there is considerable humidity. However, vines are trained on tall wire trellises anchored by granite or concrete posts. Growing grapes several feet off the ground, high enough for vineyard workers to stand upright beneath the clusters, also allows for air circulation that ameliorates the effects of humidity-nurtured diseases such as mildew. The leaf canopy shades the grapes from over-exposure to the sun as well, a practical expedient because Galician summers historically can bring some surprisingly hot days - now being exacerbated by global warming. Even though Atlantic waters can be quite bracing and bring refreshing breezes to the vineyards, the climate is actually warm enough to support some very popular summer beach resorts. The Tasting Trip: A tasting trip through Galicia in early August provided a refresher course on the progress of the native varieties in each of Galicia's five denominaciones de origen: Monterrei, Ribeiro, Rías Baixas, Ribeira Sacra and Valdeorras. I encountered considerable progress since my last major trek in 2002 and a Rías Baixas sortie in 2004. In the case of several estates, I was pleasantly surprised by either world-class "made" wines or evolving wines that would soon fulfill that promise. On my previous visit I flew into Santiago de Compostela, the famous monumental city at the end of the Camino de Santiago (the medieval pilgrimage route that runs from France down into the Iberian Peninsula and then some 500 miles across northern Spain. This time, however, I opted to drive in from the Ribera del Duero in Castilla y León to for a first visit Monterrei, a small DO comprising some 1,650 acres of qualifying vineyards located just north of the Portuguese border in the eastern mountains of Orense province. 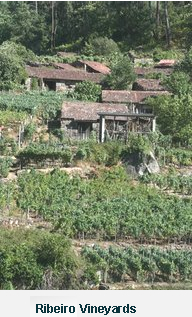 Monterrei: I was drawn to Monterrei by one particular adega - as bodegas are called in Galicia. Gargalo, the producer of Terra do Gargalo, a light, racy, mineral-laced, but nicely fruity wine that Iberia Airlines serves its business class passengers. Gargalo is located in Verín, a quaint, sprawling town that is watered by the Tamega River and located less than ten miles north of the Portuguese border. Mountainous terrain, denuded of vegetation by widespread fires of suspicious nature that have plagued Galicia for the past several summers, surrounds the town. On a high promontory outside of town, with spectacular views overlooking Verín, the vineyards and the sweeping Val de Monterrei, sits the striking Acrópolis de Verín, a complex that includes the 15th-century Castillo de Monterrei, a Renaissance palace and the medieval Gothic Santa María church. A few hundred yards away, on the opposite promontory with superb views is the rustic former Jesuit convent that is now the comfortable Parador de Turismo, the hotel where I make base while touring the region's vineyards. Adegas Gargalo is a small winery with a chic, modern cubist design that befits owner Roberto Verino, a Spanish fashion designer and Verín native. 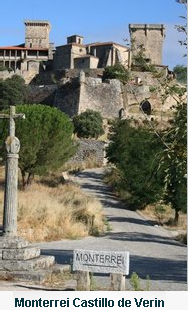 Located just down the hill from the castle and the parador, Gargalo is set amid sloping vineyards planted primarily with the native white grapes treixadura, godello and dona blanca; and native red varieties arauxa, mencia and bastarda (some wineries here also have the equally ill-named monstruosa, a white grape). There is also a fascinating experimental vineyard planted with a wide variety of primarily white grapes that are described to me by Rosa Salgado, Gargalo's shy, but informative enologist, who leads me on a tour of winery and vineyards. She explains that the trellised main vineyards, now some 20 years old, are predominately planted in treixadura, godello and mencia. Back in the winery, Roberto Verino's status as a top designer is underscored by the large blowups of models wearing his clothing juxtaposed against horizontal Bucher presses and large blowups of Gargalo wine bottles. Ribeiro D.O. : About an hour northwest of Monterrei lies the Ribeiro DO, with its production of 85 percent whites, made from 7,500 acres of vines in 13 municipalities in western Ourense province. Some of the best producers are located around the captivating medieval town of Ribadavia, located some 20 miles southwest of Ourense, the provincial capital. Ribadavia is a fascinating trip back in time that counts among its attractions the 14th-century castle of the Counts of Ribavia, a 12th-century transitional romanesque church, an evocative medieval former Jewish quarter and substantial remains of the town's old walls overlooking the Avia and Minho rivers, the latter of which, a few miles to the southwest, flows on to form the border with northwestern Portugal. Vines and Wines of Ribeiro: As close as any Galician wine to being the Spanish equivalent of France's Muscadet, the wines of Ribeiro, because of the climate, which averages 37 inches of rainfall and just over 1,900 hours of sunlight annually, have historically been lean and razor-edged; recently they have become increasingly richer, but still never overblown or heavy. Grown in granite-laced soils, often with alluvial deposits of stones and gravel, Ribeiro's officially "preferred" white grapes are treixadura, godello, albariño, jerez and torrontés, yet loureiro, macabeo (viura), albilla, and the experimental variety, lado, are also permitted. Overcropping for high production levels kept these reasonably priced native wines from achieving their full potential in the past. But in recent years, the rising quality levels of Spanish white wines in general have begun to lift all the vino blanco boats to a higher tide, Ribeiro being a notable example. In addition to racy acidity and better fruit flavors, many of these wines also express a classy mineral quality. They are delightful with mollusks (especially raw oysters and clams), crustaceans and fish. More than once on this trip (and also in Madrid and New York), I tasted solo and with meals several very accessible, reasonably priced Ribeiros, all of which were delicious, balanced and refreshingly low (for the present times) in alcohol. Emilio Rojo, a former engineer with a reputation for eccentricity, is generally recognized as the star of the Ribeiro. Several years ago, Rojo returned to his native Galicia to make some 9,000 bottles of wine annually from five acres of old, low yield vines hugging terraced hillsides. A blend of 55 percent treixadura, 15 percent loureiro, 10 percent lado, 10 percent albariño and 10 percent torrontés, Emilio Rojo's eponymous wine displays racy acids, moderate alcohol and exotic flavors of orange, lime, tropical fruit and spice; its haunting finish is laced with minerals and is not marred by oak. Also from Ribeiro, Viña Meín, made from 80 percent treixadura, 10 percent godello, 5 percent loureiro, plus traces of albariño, torrontés and lado, is a bracing wine with substantive pear and melon flavors, and a long mineral finish; the wine proved a fine companion for grilled prawns and small, flash-fried red mullets at Rafa restaurante in Madrid. The inexpensive Bodegas Campante Gran Reboreda (80 percent treixadura, 10 percent godello, 10 percent loureiro), made by the same company as Morgadio Albariño in Rías Baixas, is fresh, lively, minerally and a perfect food companion. Even the wines from the region's very large Vitivinicola del Ribeiro, the 70,000-case Viña Costeira and the 85,000-case Pazo, can be delightful with tapas and Galician dishes such as pulpo a la gallega (steamed octopus with paprika, olive oil and sea salt). Wow! that was a lot of information to be packed in a single article. Thanks for a wonderful journey through Galicia. I haven't been to those wonderful vineyards yet, but whenever an oppurtunity presents itself, I will go for it without a thought.